Now that the good weather’s here, I’m always on the lookout for delicious and nutritious recipes for the summer months. I’ve never been a big fan of Hummus or Guacamole, finding both chickpeas and avocado rather bland in their own ways. But combined, with a few extras thrown in – I’m loving my Hummamole, and I’m sure you will, too! Simply throw all the ingredients into a food processor and blend until smooth. Add a little water to thin out the consistency if you prefer. 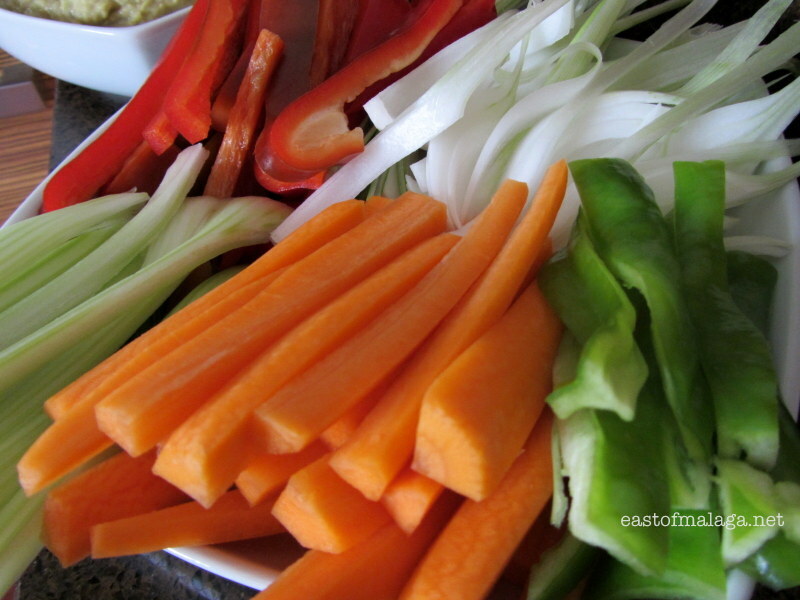 I usually cut some batons of carrots, red and green peppers, celery and red onions for dipping in, and the Hummamole will keep in the fridge for a few days. This entry was tagged Andalucía, East of Malaga, Food, life, lifestyle, nutritious recipes, recipes, Spain, Tapas, vegetarian. Bookmark the permalink. Pingback: Spanish Omelette: Tortilla Española | East of Málaga .... and more! Mmmhh that looks so yummy it will be one of our next meals! As we are such junk food addicts I doubt that we will have it with healthy fresh veggies though, probably more like with nachos hehe. That looks like a delicious dip. Healthy too. that looks and sounds incredible – guess what I am getting top up to soon as I can hit a shop! Hope you enjoy it, Marco. Of course I will – waiting for my car – almost done with it, or so they say – then it’s off into the sunset…I think. Great presentation and looks delicious! Give it a try – it IS delicious! This looks delicious! I eat hummus everyday! 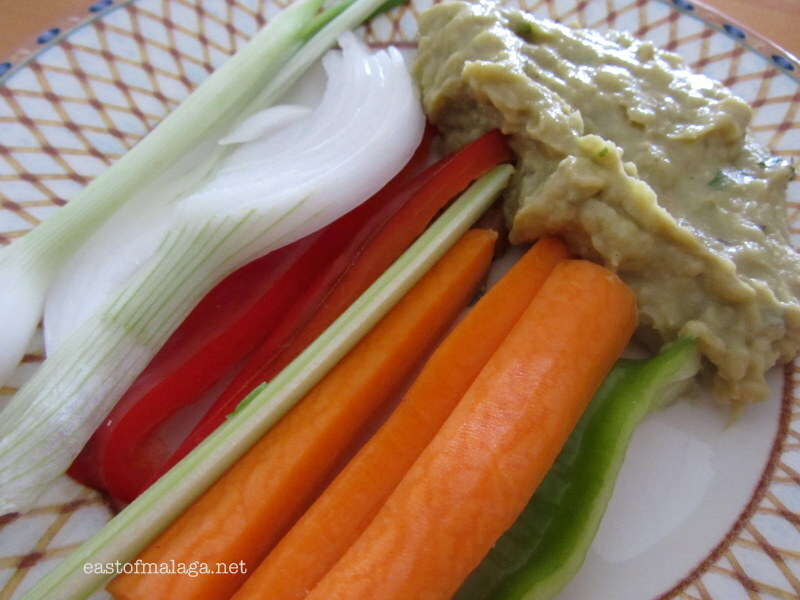 Sure – avocado flavoured hummus for you then, to make a nice change! You hooked me! Two of my favorite things EVER, I’m def going to make this. I eat so much hummus, and I love avos but I’ve never thought to combine them. Genius! I hope you will let me know how you get on! Avocados are one of my favorite foods and I’ve always been a big fan of both Hummus and Guacamole but I can’t imagine combining them…? I think it may be too much for my sensitive digestion. Intriguing! 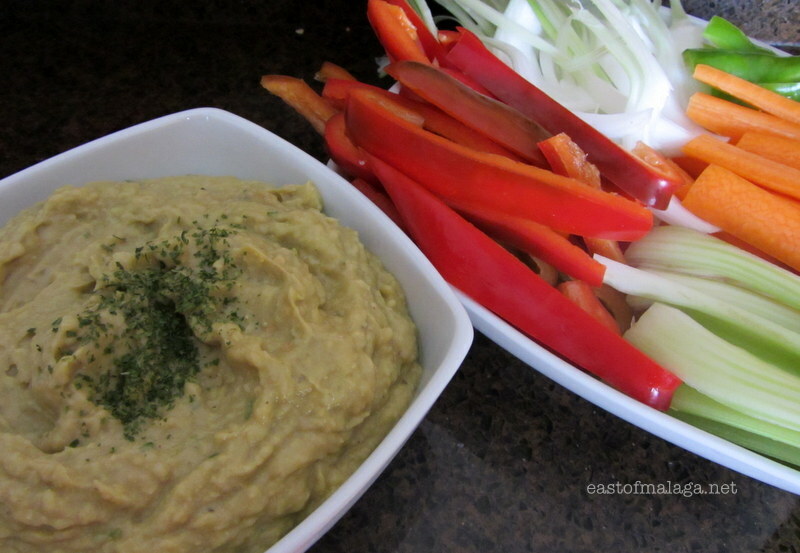 I love both hummus and guacamole, so I am going to have to try this! Do let me know how you get on, won’t you, Naomi? Yes, I will. And I’ve already sent it on to my son, who is a marvelous cook! …and the balsamic vinegar gives it a lovely kick! Definitely up for giving this a try! Thank you! Don’t know how it tastes but I love the name!!! Food photos make me hungry! I love both of those dips/spreads on their own so am intrigued to try blending them. I also love the name you have given the dish … hilarious! Thanks! Looks great and healthy as well!! It really IS, Paula. Perfect for the summer and so healthy! Is it good with cucumbers too? Sure – I think it would be perfect with any vegetables.